Dr Wolfaardt is a Director of Clinics and International Relations of the Institute of Reconstructive Sciences in Medicine (iRSM) and is appointed as a Full Professor in the Faculty of Medicine and Dentistry, University of Alberta, Canada. His clinical and research interests are in the area of maxillofacial prosthetics with particular emphasis in the area of head and neck reconstruction, osseointegration and treatment outcomes. 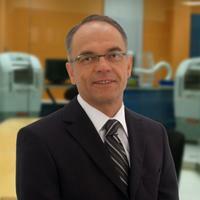 Dr Wolfaardt has led the development of the research program at iRSM. His research interests involve treatment outcomes, digital technologies in head and neck reconstruction and biomechanics of osseointegrated implants. Dr Wolfaardt has a special interest in quality management and he led the quality initiative that enabled iRSM to register an ISO9000 quality system for the clinical and research aspects of osseointegration care. Dr Wolfaardt has published over 80 papers in refereed journals and contributed to a variety of texts. He has lectured both nationally and internationally on maxillofacial prosthetics, osseointegration in head and neck reconstruction, challenges of introduction of advanced digital technology, knowledge work, teamwork and quality management. Dr Wolfaardt is elected to the Boards of the International Society of Maxillofacial Rehabilitation, the American Academy of Maxillofacial Prosthetics and the International College of Prosthodontists.